We all know we should be eating more whole grains. But what exactly are whole grains? And how can we make them not only what we should eat, but what we really want to eat? 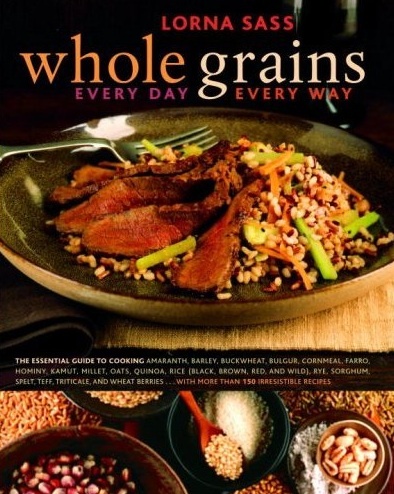 In Whole Grains Every Day, Every Way, Lorna Sass demystifies whole grains with a thorough grain-by-grain primer followed by more than 150 irresistible recipes. Sass introduces home cooks to dozens of grains, including amaranth, barley, buckwheat, hominy, popcorn, polenta, Job’s tears, millet, oats, quinoa, brown rice, red rice, black rice, rye, triticale, sorghum, teff, farro, grano, green wheat, kamut, spelt, wheat berries, and wild rice. Sass shares tips for buying and storing these grains as well as the best and simplest ways to cook them. Her recipes are boldly flavored, contemporary recipes that will truly change the way you cook, covering soups, salads, main courses, and side dishes all the way to quick breads, cookies, and desserts, with a groundbreaking section on whole-grain baking outlining tempting, healthy options. Whole Grains Every Day, Every Way will delight carnivores and vegetarians alike with recipes such as Farro Salad with Prosciutto and Asparagus, Masa Harina Beef Casserole, Posole with Pork and Chipotle, Millet with Gingered Beets and Orange, and Coconut–Black Rice Pudding. This is the book America has been asking for: the definitive guide that will make it easy and delicious for us to incorporate healthful whole grains into our diets with innovative recipes for every meal of the day.